Mr. Calvin Lee Ardrey, age 81, of Temple passed away on Sunday, December 23, 2018. He was born in Altoona, Pennsylvania on Tuesday, May 25, 1937. Mr. Ardrey was the son of the late Clarence Ardrey and the late Ruby (Rudasill) Ardrey. Besides his parents, Mr. Ardrey is preceded in death by his wife, Judith Aileen (Vandrew) Ardrey; his brothers, Glenn Ardrey, Robert Ardrey, and George Ardrey and his sister, Beverly Coleman. Survivors include his son and daughter-in-law, Brian and Lorrie Ardrey of Temple, Georgia; four daughters and two sons-in-law, Paula Ardrey of Bolivar, Pennsylvania, Peggy Ardrey-Stranford of Tallapoosa, Georgia, Lisa and John Thompson of Lawrenceville, Georgia and Veronica and Ronald Hull of Acme, Pennsylvania; eleven grandchildren, ten great-grandchildren and a number of other relatives. Mr. Ardrey served in the Marine Corps Reserve and was a former steel worker for Bethlehem Steel in Johnstown, Pennsylvania. 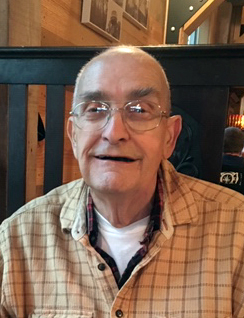 He was also a member of multiple organizations, some of which include: a Western Pennsylvania Regional CB Club where his handle was “PA Sailor Boy”, (RVICS) Roving Volunteers In Christ’s Service, Ombudsman Senior Advocacy Services, a weekend gospel music event coordinator in Western Pennsylvania, and he was active in the Temple Senior Center. Mr. Ardrey was a former Deacon at Valley Grace Brethren Church in Armagh, Pennsylvania and was currently serving as a Deacon at the First Baptist Church of Temple, Georgia. In accordance with Mr. Ardrey’s wishes, he will be cremated. Memorial services will be conducted on Friday, December 28, 2018 at 2P.M. from the First Baptist Church of Temple with Reverend Larry Boswell officiating.